Korg is known for its affordable digital pianos and keyboards with great quality and contemporary design. However, the brand is probably not as popular as, say, Casio or Yamaha that also offer some excellent digital pianos in this price range. So Korg have to work really hard to keep up with the competition and offer something new and innovative. And in this review, we’re going to find out how it’s going so far! Korg has recently released two entry-level digital pianos, the B1 and the B1SP. Both are entry-level pianos with 88-key hammer action keyboard, 18 W onboard speakers, and 120-note polyphony. 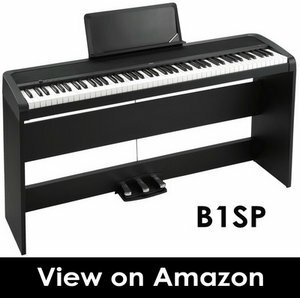 The B1 and the B1SP are exactly the same pianos except the B1SP comes with a furniture stand and 3-pedal unit, while the B1 doesn’t. So everything I’ll talk about in this review is also applicable to the B1SP. Let’s jump right into the review to see if Korg new pianos can offer a better playing experience than competitive pianos from Casio and Yamaha. At the end of the review, we’ll also look at the main competitors to the B1/B1SP. Korg B1 is a portable digital piano with an elegant design. The long speaker grill on the front adds more character to the piano and makes it stand out from other keyboards. The B1 doesn’t come with a stand. And even though Korg offers an optional furniture stand (sold separately), I’ve found an even better option that I’ll talk about in the “Accessories” section of the review. The B1 is a relatively compact keyboard. It will easily fit into a small room without cluttering the space. The piano can even be put on a desk or a table, but of course, it’s not as convenient as having it on a stand. The B1 has a standard width (51.6″) but is a bit deeper (13.2″) than its main competitors. As you can see the piano is also lightweight. An adult will able to move the piano around without any extra help. All this makes the B1 easy to transport and a great choice to take to gigs. With that said, the piano might lack some extra functionality that a stage piano would provide you, such as Line Out jacks, a USB port, additional settings/sounds/effects, etc. So I’d say the B1 is more suitable for home use and traveling and not for live performances. The B1 would also be a perfect solution for a college student who needs piano compact enough to fit into a dorm room. Moreover, the B1 just like any digital piano will allow you plug in headphones and practice in silence without disturbing others. The front panel of the piano is very simple. There are 4 buttons and a master volume knob. 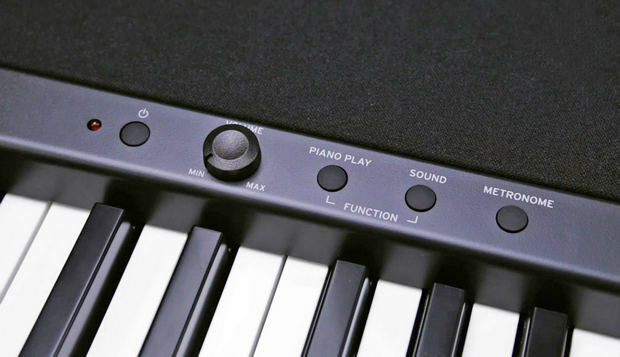 To access all the sound and functions of the B1, you’ll need to press a certain “Key + Button” combination. The piano isn’t equipped with a display, which would show you current settings and facilitate navigating the instrument. 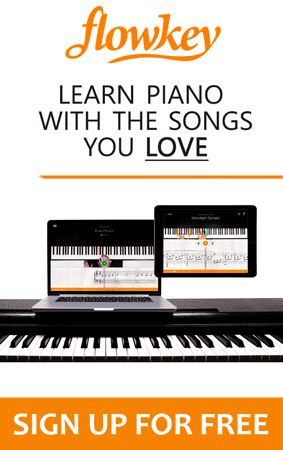 Luckily, the B1 is a fairly straightforward piano, so you’ll quickly memorize the main key combinations for the sounds and functions you use most often. The B1 is available in two colors, black and white. Both colors look very stylish, except the black version will be a bit easier to maintain. 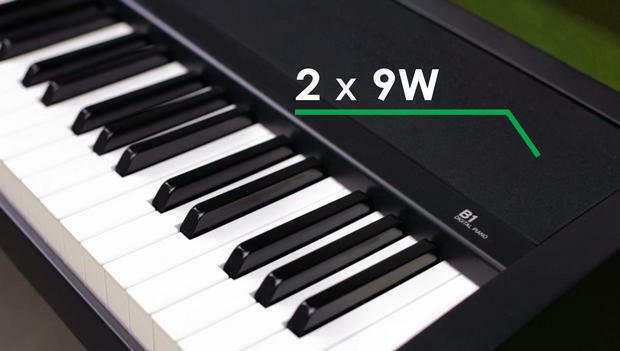 The B1 features 88-key Natural Weighted Action (NH) keyboard. The piano uses real hammers to recreate the feel and response of an acoustic piano. The keys of the piano are weighted differently being heavier on the low-end and lighter on the high-end, just like on an acoustic piano where each individual key has its own weight. The NH action keyboard is also touch-sensitive, meaning the harder you hit the keys, the louder and more expressive the sound. You can also adjust the touch-response of the keyboard to better suit your playing style. There are 3 preset settings to choose from: Lighter, Normal (default), Heavier. When the “Heavier” setting is selected, you’ll need to press the keys harder (compared to the “Normal” setting) to produce powerful sound. Conversely, when the “Lighter” setting is selected, the sound will be loud enough even if you play softly, which is more suitable for players with a lighter touch. In general, the “Heavier” setting provides the widest dynamic range of the 3 settings, but not everyone will find this setting the most suitable for their playing style. 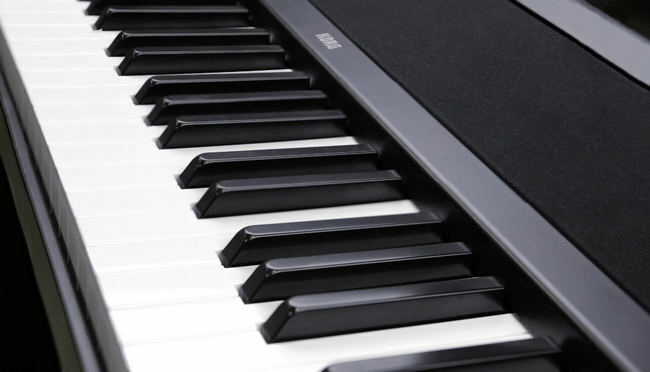 The keys of the B1 are made of plastic, which is true for most digital pianos in this price range. Unfortunately, the keys don’t have ivory and ebony textured surfaces to increase finger grip and prevent fingers from slipping off when they become moist. The white keys of the B1 are glossy, while the black ones have a matte finish on them (more like satin). In overall, the NH action feels pretty realistic and close to an acoustic piano, but it’s nothing special. The NH is pretty much on the same level as Yamaha’s GHS action, maybe a tiny bit lighter. At the same time, the Scaled Hammer Action II of the Casio PX-160 is slightly heavier, and the keys have synthetic Ivory & Ebony keytops. Anyway, all of the actions mentioned above are hammer actions, so they’re all quite heavy and weighted similar to a real piano. The B1 utilizes the Korg’s improved PCM stereo sampling technology, which offers not only an authentic piano sound but also several other great sounds. 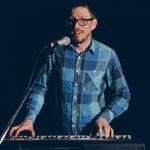 While primarily a digital piano is designed to reproduce the piano sound as naturally as possible, it’s always nice to play around with other instrument sounds from time to time. Although each of the 8 onboard sounds has its optimal effect settings, you can still adjust the Reverb and Chorus effects by turning them on and off (no level adjustment available). Moreover, when it comes to piano sounds, the B1 reproduces the sympathetic string resonance and damper resonance, which makes the sound richer and more natural. Below you can listen to how each of the B1’s instruments sounds. The K1 is equipped with 2 x (10 cm x 5 cm) full-range speakers with 18W power output (9W + 9W). 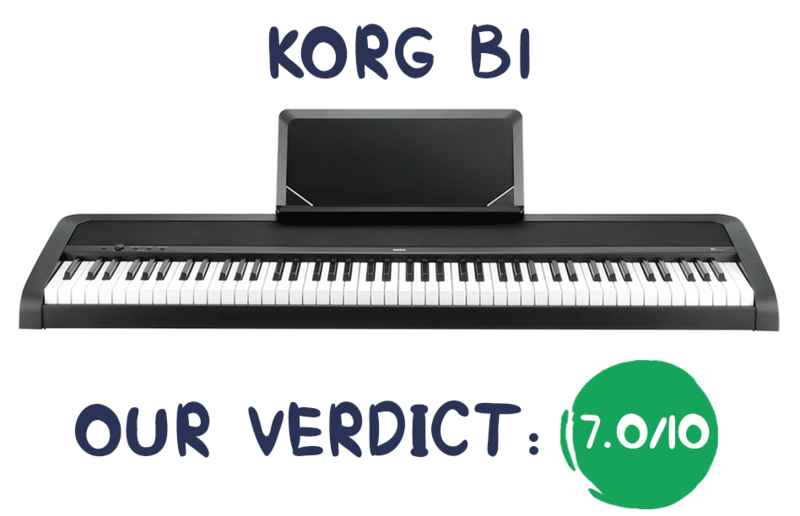 Korg has considerably improved how the instrument sound through the speakers, particularly by implementing Motional Feedback (MFB) technology, which is actually quite surprising to see on the entry-level piano. The MFB system allows the speakers to more accurately reproduce low frequencies by controlling the movement of the speaker cone. It also helps to cope with room acoustics. Not just bass, the B1 sounds great across the full frequency range. I wouldn’t say the speakers of the B1 stand out so much from the competition, but they sure produce rich and clear sound and in my opinion perform slightly better than the competitors (Yamaha P-45, Casio PX-160) in most situations. The volume is not overly loud at the maximum volume, but it’s definitely loud enough to fill a small to medium room without the need for supplemental speakers. The B1 is equipped 120-note polyphony, which enable you to play complex classical pieces with fast note repetition without worrying about notes dropping off. And since the instrument doesn’t have a Dual Mode (Layering) or a muilti-track MIDI recorder, you’re not going to need all 120 notes of polyphony at a time. The B1 doesn’t have many bells and whistles and only offers a few basic features, such as an onboard metronome, transpose and tuning function and a Partner Mode. Unfortunately, the piano doesn’t have a Split or Dual mode found on many digital pianos from other brands. The modes would allow to play two different instrument sounds at the same time by either layering them (Dual Mode) or splitting them (Split Mode) between the left and right hand. What the B1do offer is the Partner Mode (also called Duet Play). The Partner Mode will split the keyboard into two equal sections with the same pitch ranges allowing for a side-by-side practice. For example, an instructor can play some tunes on the left side of the keyboard, and a student can follow along on the right side playing the exact same notes. The B1 doesn’t have an onboard MIDI recorder to record and playback your performances. The piano doesn’t have any built-in songs (for practice and listening) or accompaniment rhythms, which is quite upsetting as almost all of the B1’s competitors have these features. Like any digital piano, the B1 doesn’t need to be tuned. At the same time you can adjust the pitch of the keyboard using transpose and tuning function. The transpose function allows you to raise or lower the pitch of the entire keyboard in semitone steps. For example, you can transpose a song written in a difficult key (e.g. many black keys) to a different key with easier chords. The Fine tuning function allows you to change the pitch of the entire keyboard in 0.5Hz steps (from the standard A4= 440Hz). The function is particularly useful when you need to match the pitch of another instrument (e.g. old piano, ) or vocalist. Another useful feature of the B1 is a built-in metronome. The metronome provides a steady beat to play along with. Regular practice with a metronome helps develop such important skills as time-keeping and a sense of rhythm. The time-signature, tempo and volume of the metronome can be adjusted to suit your needs. When it comes to connectivity capabilities, the B1 is very basic. It has only 2 jacks. One is a 1/8” (3.5 mm) headphone jack that can also be used as a Line Out. This means you can use it for connecting not only the headphones but also an external amplifier, speakers, etc. 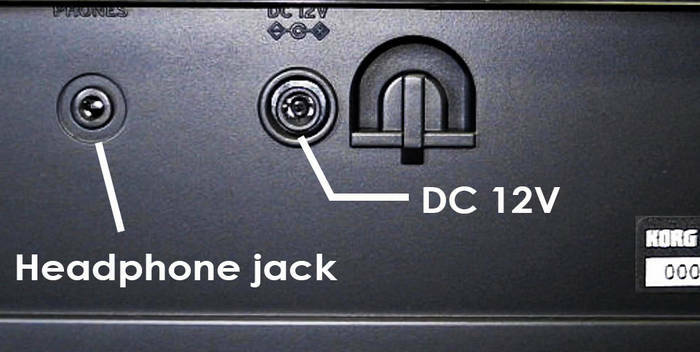 The jack is located on the rear panel, which is quite inconvenient. 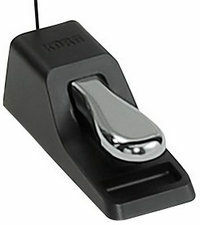 On the bottom of the piano you’ll find a ¼” sustain pedal jack used for connecting the supplied sustain pedal or an optional 3-pedal unit that you can buy separately. The B1 doesn’t have a USB port or MIDI In/Out jacks, so you won’t be able to use the piano as a MIDI controller. You also won’t be able to connect the piano to the computer and use with various education and music production software. It’s not necessarily a deal breaker, but it’s kind of strange for the 500$ digital piano not to have the USB terminal, while almost every $200+ keyboard today supports either the USB or Bluetooth connectivity or sometimes both. The 3 most popular types of stands are X-type, Z-type and furniture-style stands. X- and Z-type stands are more portable than furniture ones and therefore are easier to move around or put in storage. Moreover, if you plan to move the keyboard from one place to another (e.g., gigs, trips), an X-type collapsible stand is the best option. 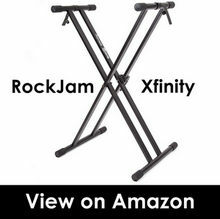 It will easily fit into a car and doesn’t require a screwdriver to remove it from the stand. A furniture stand is not as mobile as Z-/X-type stands but is a great stationary solution that will securely hold the keyboard in place and will be a nice addition to a home interior. As I mentioned earlier, Korg offers the STB1 furniture-style stand for the B1. However, if you decide to buy the piano with the STB1 stand, you’d want to think twice before doing that. The thing is that there is another digital piano from Korg called the B1SP. It’s basically the same digital piano as the B1 but comes with a furniture stand and a triple pedal unit. The B1SP costs only 100$ more than the B1, which is the same amount of money you would spend on the STB1 furniture stand for the B1, but with the B1SP you also get a triple-pedal unit! In addition to that Amazon will include the Knox piano bench in the package. You can actually save some good money, considering the pedal unit cost around 80-100$ (if bought separately) and 40-60$ you would spend on a bench. Unlike many entry-level digital pianos that come with flimsy box-like footswitches, the B1 comes with a piano-style pedal. It’s a well-built unit with metal construction and half pedal support. So there is absolutely no reason to buy a replacement to the included damper pedal unless you need all three piano pedals (3-pedal unit). 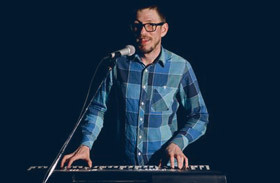 The B1 is a fairly portable piano, which means you can take it to gigs, rehearsals, etc. To protect the keyboard during transportations, you may want to consider buying a padded keyboard bag. Korg doesn’t offer any bags/cases for the B1, but there are lots of options from other brands available on Amazon. It seems Korg’s goal was to make the B1 as straightforward as possible, targeting piano players who appreciate simplicity. The piano doesn’t have some features we’re used to seeing on digital pianos in this price range, such as onboard MIDI recorder, Split and Dual modes, USB connectivity, etc. However, some players may simply not need all those fancy features and only want to use the instrument as a piano. In this case, the B1 will not disappoint you. 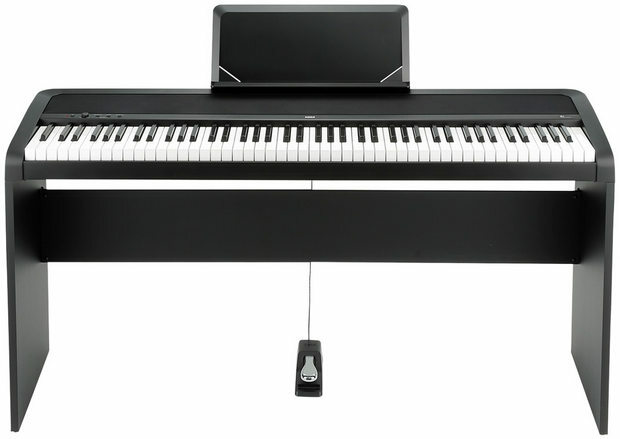 Just like any digital piano, the B1 has significant advantages over acoustic pianos. It’s much more compact, doesn’t need to be tuned, not to mention that you can adjust the volume and use headphones for silent practice. The piano is equipped with a fairly realistic 88-key hammer action keyboard. The Grand Piano tone with simulated string and damper resonance as well as 7 other instrument sounds are delivered via high-quality 18W speakers with Motion Feedback technology, which makes the sound very enjoyable. The B1 is a great instrument for beginners and intermediate players who want a no-frills digital piano with a portable design. Unfortunately, the B1 doesn’t have any educational features, such as a lesson mode, which students would definitely appreciate. With all that being said, I encourage you to take a look at the two digital pianos I’ve listed below, which, in my opinion, offer more bang for the buck in terms of features/functions, and sound just as good (or even better) as the Korg B1 . These two pianos are very similar in many ways and both are entry-level portable pianos with minimal features. Keep in mind that the P-45 is 50$ (the P71 is 100$) cheaper than the Korg. Both pianos offer fully-weighted hammer action keyboard with 88 keys, which is an important feature for building proper finger strengths and technique. The P-45 uses Graded Hammer Standard (GHS) action, while the B1 is equipped with the Natural Weighted Hammer (NH). In practice, the actions feel very similar, and both offer a nice, realistic feel for the price. Being about 50$ more expensive than the P-45, the Korg B1 offers almost twice as much polyphony (120 notes vs 64 notes in the P-45) and more powerful speaker system with a total output of 18W (12 W in the P-45), which provides louder and deeper sound. On the other hand, the P-45 has a few more instrument sounds to choose from (10 vs 8), Dual and Duo Modes and a USB type B port, which allows you to connect the P-45 to a computer and use as a MIDI controller. Both pianos come with basic functions such as a metronome, transpose and tuning function. Right from the start, I’d like to point out that the PX-160 offers much more features than the Korg keyboard, which includes an onboard MIDI recorder, playback capability, 50 preset songs (for listening/practice), Duo and Dual Modes, USB type B port. But not just that, the PX-160 offers 10 more instrument sounds and a hammer action keyboard, which unlike Korg’s keyboard has synthetic Ivory & Ebony keytops and uses triple sensor detection system. On the contrary, the Korg B1 has slightly more powerful speakers (18W vs 16W in the PX-160) and comes with a better quality sustain pedal. From the sound perspective, both instruments sound very good especially through headphones, so there’s no a definite winner here. 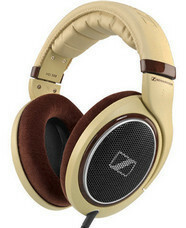 To my taste the PX-160 sounds a bit brighter and fuller, while the B1 performs better on the low end. Unfortunately, there is no video with a sound comparison that I could find. And considering that sound perception is very subjective, I’d recommend comparing the pianos side by side in your nearest music store if you can’t decide between the two. Could you check the count for the headphone jacks? You do mention 2 jacks, but you only describe one (which at the back). Hi, the Korg B1 has only one headphone jack. I hope this helps.